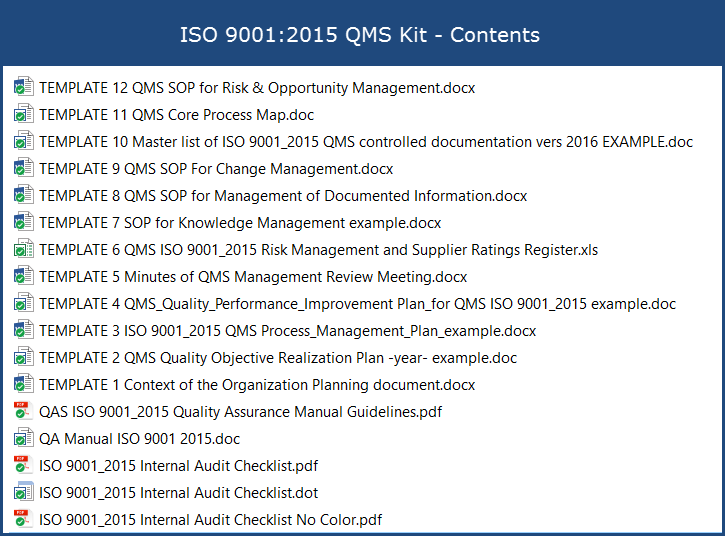 This ISO 9001:2015 QMS Implementation Kit includes a fully editable Quality Assurance Manual, valuable templates for effective development of the standard's QMS structures, an Implementation Guide, and a comprehensive Gap Assessment Internal Audit Checklist. The templates include pre-formulated Quality Plan documents to cover all the most important “hard to establish” but required clauses of ISO 9001:2015. This saves you extensive time in the development or transition of your ISO 9001:2015 compliant QMS! ISO experts and certified internal auditors with transition experience on ISO 9001:2015 developed all the material in this kit. This kit teaches you proven practices, helps you implement the standard, and keeps your QMS project on a budget. Incorporating these needs / expectations into the processes that make up your QMS. Identifying the process owner requirements and providing appropriate evidence to demonstrate compliance to ISO 9001:2015. The 2015 standard increases focus on process management requirements. The differences concerning the requirements for procedures, records and the quality manual of ISO 9001:2015 by using the Template for Masterlist of Documented Information. Applying the Risk Analysis method based on ISO 9001:2015 requirements for identifying the organization’s risks and opportunities and how they relate to the standard. Handling Change Management with required records and history. With this kit, you will feel like an experienced ISO Consultant is sitting by your side supporting your QMS development. 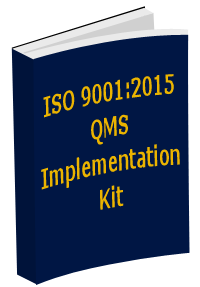 The ISO 9001:2015 QMS Implementation Kit comes with a detailed and practicable “hands-on” Implementation Guideline. This provides a step by step implementation approach, so you can implement or transition to your ISO 9001:2015 QMS with no difficulties or project delays. You will learn how to manage the need to incorporate customer needs and expectations into your QMS - Apply “risk-based thinking"
The ISO 9001:2015 QMS Kit includes our popular fully editable QA Manual Template. Quality Assurance Solutions developed, with several ISO 9001:2015 experts, a comprehensive Quality Assurance Manual for 100% compliance with the ISO 9001:2015 standard. I recommend starting with this manual, and then editing it to match your company's terms. It is 44 pages long and covers all ISO 9001 elements necessary for certification. We separately sell this manual and include it in this kit. As a benefit, at the appropriate locations, the QA Manual makes reference to the templates included in this kit. Required on-going audits of your ISO 9001:2015 Quality Management System. Required audit evidence and documentation. Find hidden trouble areas before External Auditors surprise you.